So, if I had a boss who told me just how I was going to be evaluated, the first thing I'd do would NOT be to run off and get a lawyer to argue otherwise. But, I'm not a superintendent. Attorneys for the Knox County Board of Education and Superintendent Dr. Jim McIntyre are at odds over who calls the shots about how to conduct the evaluation for the school system's top leader. The disagreement comes as a superintendent evaluation committee, which is comprised of BOE members, is meeting to develop a new process to evaluate McIntyre for the next school year. When Patti Bounds was elected to the school board last year, she said she wanted to see the board implement a more rigorous and data-driven evaluation in order to more accurately measure the superintendent's progress. "The best solution is to come up with a very fair and rigorous evaluation protocol for Dr. McIntyre and future superintendents that he would agree with and that he finds acceptable to him, and then everything's OK," Bounds said. 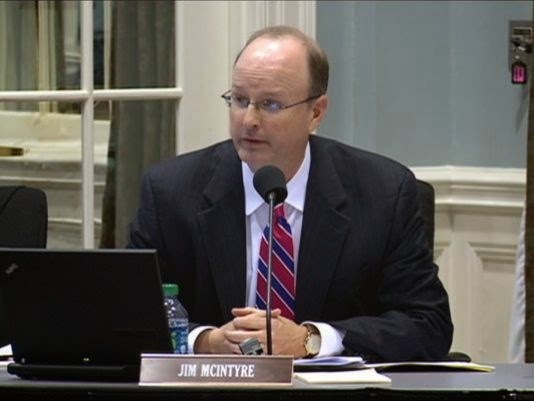 A clause in McIntyre's contract states the board "shall evaluate and assess" McIntyre's work once a year, looking at job performance, student achievement, and his relationships with staff, personnel, board members and the community. The evaluation is an annual process mandated by Tennessee law. Bounds chairs the committee tasked with recommending improvements to the evaluation process, which met for the first time in January and the second time Wednesday. Its third meeting is in May, and Bounds said she hopes to have a revised evaluation process recommendation to board members by August. McIntyre's contract also says the evaluation "shall be in writing" and in a form that "is mutually agreeable" between the board and the superintendent. When that came to Bounds' attention, she wondered whether "mutually agreeable" means McIntyre can reject an evaluation process he doesn't like, so she consulted Richard "Bud" Armstrong, the board's attorney and county law director. As detailed in a memorandum to Bounds earlier this month, Armstrong concluded the clause is illegal and makes McIntyre a "super-majority of one." "The effect of this contract clause is to grant a power to the Superintendent to veto an evaluation plan developed and passed by the Board of Education," Armstrong opined. "The Superintendent has no such power granted to him by statute." State law, he said, gives the school board "the sole authority to create and implement" the superintendent's job performance evaluation. The rest of the story RIGHT SMACK HERE.